"Gilbert & Gaillard" has rated the wine "Enrico Pierazzuoli Tenuta Le Farnete Carmignano Riserva DOCG, Tuscany, Italy" from the vintage 2008 on 26.06.2012 with 89 of 100 points.
" Dark ruby-red. Warm, intense and vinous nose suggestive of black fruits and wild fennel. Fresh, full and clearly-etched palate that is tannic, peppery and shows a lovely focused finish. Drink with meats cooked rare. " "Vinous Antonio Galloni" has rated the wine "Enrico Pierazzuoli Tenuta Le Farnete Carmignano Riserva DOCG, Tuscany, Italy" from the vintage 2009 on 01.09.2012 with 93 of 100 points. "Vinous Antonio Galloni" has rated the wine "Enrico Pierazzuoli Tenuta Le Farnete Carmignano Riserva DOCG, Tuscany, Italy" from the vintage 2008 on 01.08.2011 with 88 of 100 points. "Vinous Antonio Galloni" has rated the wine "Enrico Pierazzuoli Tenuta Le Farnete Carmignano Riserva DOCG, Tuscany, Italy" from the vintage 2007 on 01.10.2010 with 89 of 100 points. "Vinous Antonio Galloni" has rated the wine "Enrico Pierazzuoli Tenuta Le Farnete Carmignano Riserva DOCG, Tuscany, Italy" from the vintage 2005 on 01.08.2009 with 91 of 100 points. "Wine Spectator" has rated the wine "Enrico Pierazzuoli Tenuta Le Farnete Carmignano Riserva DOCG, Tuscany, Italy" from the vintage 2001 on 31.10.2005 with 91 of 100 points. 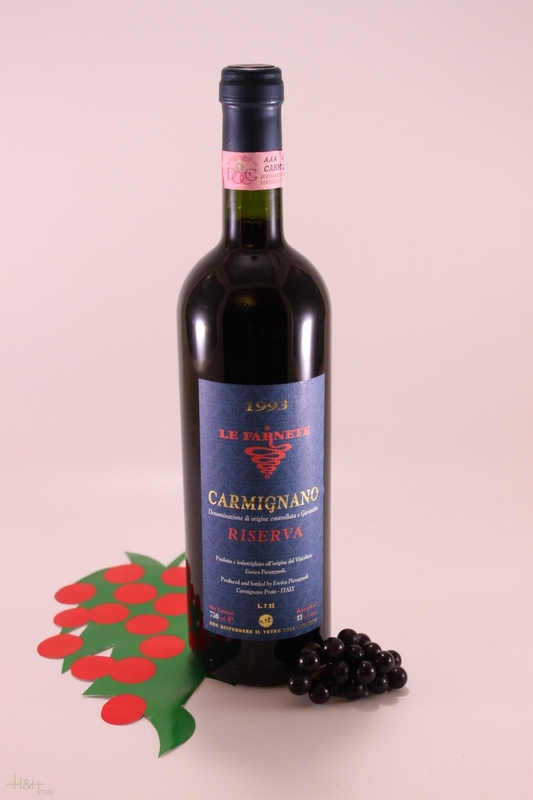 "Wine & Spirits Magazine" has rated the wine "Enrico Pierazzuoli Tenuta Le Farnete Carmignano Riserva DOCG, Tuscany, Italy" from the vintage 1997 on 01.04.2001 with 86 of 100 points. "Wine Spectator" has rated the wine "Enrico Pierazzuoli Tenuta Le Farnete Carmignano Riserva DOCG, Tuscany, Italy" from the vintage 1997 on 31.10.2000 with 89 of 100 points. "Wine Spectator" has rated the wine "Enrico Pierazzuoli Tenuta Le Farnete Carmignano Riserva DOCG, Tuscany, Italy" from the vintage 1996 on 30.11.1999 with 89 of 100 points. "Wine Spectator" has rated the wine "Enrico Pierazzuoli Tenuta Le Farnete Carmignano Riserva DOCG, Tuscany, Italy" from the vintage 1993 on 30.04.1998 with 85 of 100 points. "Stephen Tanzer" has rated the wine "Enrico Pierazzuoli Tenuta Le Farnete Carmignano Riserva DOCG, Tuscany, Italy" from the vintage 2009 with 93 of 100 points. "Stephen Tanzer" has rated the wine "Enrico Pierazzuoli Tenuta Le Farnete Carmignano Riserva DOCG, Tuscany, Italy" from the vintage 2011 with 91 of 100 points. "Stephen Tanzer" has rated the wine "Enrico Pierazzuoli Tenuta Le Farnete Carmignano Riserva DOCG, Tuscany, Italy" from the vintage 1997 with 90 of 100 points. "Stephen Tanzer" has rated the wine "Enrico Pierazzuoli Tenuta Le Farnete Carmignano Riserva DOCG, Tuscany, Italy" from the vintage 1998 with 88 of 100 points.